Address: 102 Ollie St NW, at Lena St.
Safety: No issues. I love that the mulch under the swings is wood (it’s a little safer, in my opinion). 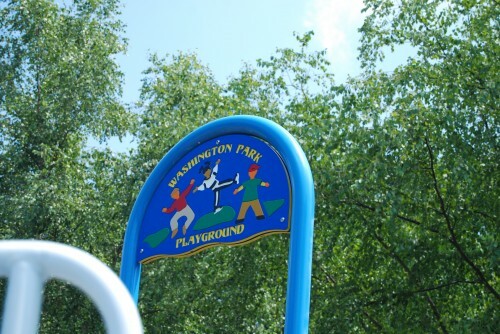 “One of the focal points of the Washington Park historic neighborhood is the recreational park. The land for the park was donated by the early 20th century African American developer Heman Perry. The park started with a gift of six and a half acres and expanded to 25 acres when completed in 1928. It originally included a swimming pool, dancehall, pavilions, and tennis courts. This historic park has been referenced in the writings of many notable Atlantans over the years as a social center for swimming, tennis, dancing, and gathering. Today, Washington Park is home to one of only 5 city of Atlanta natatoriums and a state-of-the-art tennis center. Washington Park is bordered by the proposed Beltline, which has prompted development in the surrounding Washington Park Neighborhood.